No, I am not making mental notes of what I have to add to the homemade spaghetti sauce I have stewing on to stove. Nor am I reciting some lyrics to one of the Simon & Garfunkel songs that hippie chicks involved in community theater know all the words to even today. 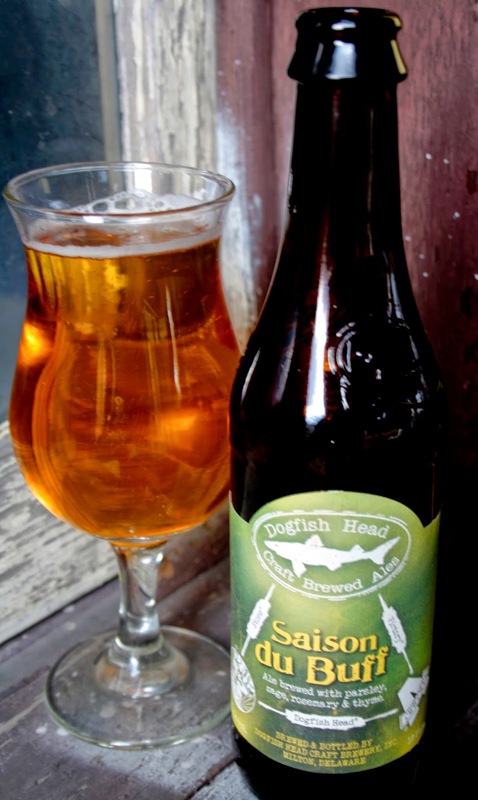 Dogfish Head's collab with the Stone and Victory Brewing companies, Saison du BUFF Ale, contains those very four spices though. Of the four things that are the bragging point of what they've included in this, the sage is the most prominent on the nose. Scents of peach, lemon, white pepper, fresh mowed grass and honey are also duly noted in the aroma. A bit different aroma that that of a usual saison as their normally a lot more funky and musty smelling, this has a cleaner, crisper redolence to it. Feeling very light in the mouth a blast of lemon tartness is very pronounced in the front followed by a Belgian yeast and fresh baked bread sweetness. The parsley, sage, rosemary and thyme come out in the middle in floral and herbal flavors but they intermingle together in a nice blend so not one of them dominates the taste. They add a different character than what is usually expected in a beer of this style. Definitely an interesting twist on it Things finish with a mix of crisp citrus tartness, grainy yeast sweetness and earthy spices. A bit of pepper hangs on in the aftertaste for a little bit but then fades into something clean.